An essential addition to the Earthscan Planning & Installing series, Planning and Installing Micro-Hydro Systems provides vital diagrams, pictures and tables detailing the planning and installing of a micro-hydro system, including information on the maintenance and economics once an installation is running. The book covers subjects such as measuring head and flow, ecological impacts, scheme layouts, practical advice, calculations and turbine choice. Archimedes screws are also covered in detail, as well as the main conventional choices relevant to small sites. Micro-hydro refers to hydropower systems with a power rating of 100kW or less. A 100kW system will produce 100 standard units of electricity in one hour. These systems have been popular in some sparsely populated or mountainous countries for a number of years, but now new technology, less stringent regulation of grid connected generators and standardised turbine designs are encouraging more widespread interest in micro-hydro in the developed world. The renewable energy sector is growing at a remarkable rate, and whilst much attention has so far focused on solar and wind technologies, Europe and elsewhere have great potential for generating power from small scale hydroelectric installations. 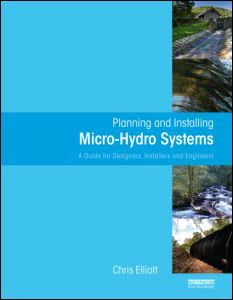 This book is aimed at site owners, designers and consultants who are looking to develop schemes in the micro-hydro scale – 5 to 100kW – although the concepts are applicable to smaller and larger schemes.